As we round third on August and head into the final month of baseball's regular season, some interesting news from Metro: the Dodger Stadium Express is sufficiently warmed up and ready to roll for the playoffs. Of course, the buses aren't quite out of the barn yet. The Dodgers still must qualify for the post-season. As of Friday morning, they hold a seemingly comfortable 9.5-game lead over Arizona in the National League West and are given a nearly 100 percent chance of making the playoffs by Baseball Prospectus (see the above chart via MLB.com). The Dodgers' magic number for cliniching the West stands at 21, meaning any combination of Los Angeles wins and Arizona losses adding up to 21 allows them to proceed to the Divisional Series in October. That translates to a likely clinching scenario in middish September and get this: the Dodgers play Arizona at home Sept. 9 to 11 and then host the Giants for four games from Sept. 12 to Sept. 15. 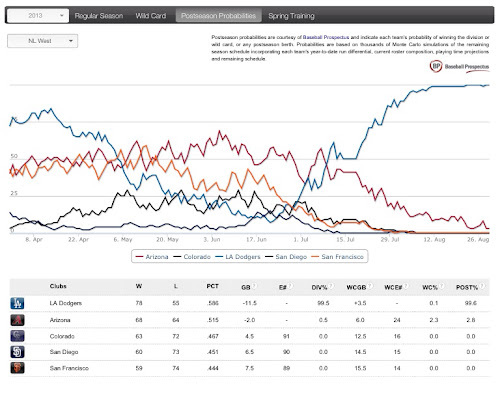 Interesting, at least if you're a Dodger fan. •Board the Dodger Stadium Express at Bus Bay 3 of the Patsaouras Transit Plaza at Union Station. •Service leaves Union Station every 5-10 minutes, starting 90 minutes before game time through the 3rd inning for all home games. We recommend arriving early; crowds are heaviest near game time. •Your Dodger ticket is good on gameday for the Dodger Stadium Express fare*; otherwise, regular Metro fares apply. •You’ll be dropped off inside Dodger Stadium behind Center Field. Service will run the same route in reverse after the game. •Return service runs until 45 minutes after the final out. Much more information here about connecting Metro and Metrolink service to Union Station, parking at Union Station and nearby dining. We'll have plenty of updates as the baseball season concludes. Other teams likely headed for the playoffs include the Braves, Cardinals, Pirates, Cincinnati Reds, Reds Sox and Tigers. Those teams have a lot of cumulative baseball history. In particular, a Reds-Dodgers playoff matchup would allow them to renew their 1970s rivalry in the NL West when the Reds claimed the division in 1970, 1972, 1973, 1975, 1976 and 1979 and the Dodgers got the division crown in 1974, 1977 and 1978. The Reds went to the World Series in 1970, '72, '75 and '76 and the Dodgers in '74, '77 and '78 with the Reds winning it all in '75 or '76. A good decade, it was. Unlike regular season games (except for opening day), the Dodgers home playoff games will most likely be sold out 90 minutes prior to the scheduled start time of the game (which is when the Dodger Stadium Express buses start running). So people won’t have to pay the service charge when purchasing Dodgers tickets online or over the phone, you should offer Dodger Stadium Express service on the 1st day NLDS playoff tickets go on sale. The service should run from 90 minutes before the scheduled opening time of the Dodger Stadium box office for that day (to give people time to get in line before the box office opens) to when they sell out all the NLDS games at Dodger Stadium or until 45 minutes after the scheduled closing time of the Dodger Stadium box office (whichever comes first). What’s the ridership number on this bus line? 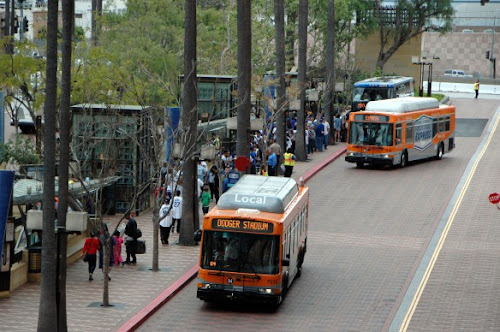 Here’s the ridership: http://www.metro.net/news/simple_pr/Dodger-Stadium-Express-Bus-Service-to-UnionStation/ 136,000, even in a down year in 2012. Also, I would expect most playoff games to sell out prior to the day of the game, as it has been a while since the Dodgers have been in the playoffs and everyone wants to see Puig. Gonzalez, Ethier, Ramirez, and maybe Kemp – so running additional early service is unnecessary. Personally, the greatest annoyance is the hike from Top Deck or Reserve to the bus stop at the pavilion. To avoid navigating the stairs full of people after the game I often walk down the hill to Sunset and take a local bus back to Downtown.